Camaraderie and support networks developed through engaging Team Performance Challenges. Fresno, home to the historic Tower Theater and hosting city for the Miss California Pageant, provides a great backdrop for your next meeting. From food festivals and farmers markets to amusement parks and sporting events, there are plenty of options to explore. One of our favorite workshops to facilitate for Fresno-based companies is Storytelling. Participants work as a team, developing the team story but also telling their own stories. Learning the performance art of storytelling and discovering how it resonates on both a personal and organizational level helps to strengthen and deepen relationships. From development to delivery, these skills will fundamentally improve your ability to influence those around you. This workshop is customized for you, because it’s about your story and we work with you to help you tell it as it has never been told. We know from years of working with successful leaders that motivating organizational teams stems from creating solid connections, building relationships and sharing the history and culture that only stories can tell. 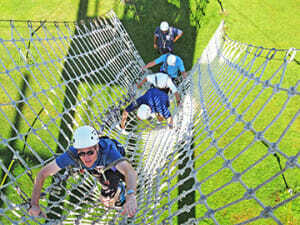 Adding a bit of adventure to your meeting can come in the form of an Indoor Rock Climbing team building event. The climbing, though fun and challenging, also provides a forum for discussing coaching, teamwork and the concept of managed risk. Another form of adventure involves asking your team what is working and what needs improvement; our Hybrid SWOT does just that. The Grand 1401 provides elegant meeting rooms perfect for this discussion as do the spacious meeting rooms and outdoor event space at Fresno’s Piccadilly Inn Shaw. We will work with you to select just the right program and site for your team.